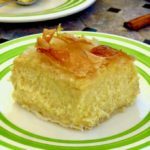 Today, we are headed for one of the most romantic places of Greece, the Peloponnese, to discover the recipe of the popular diples or thiples (Δίπλες), traditionally served at weddings, baptisms, and New Year. 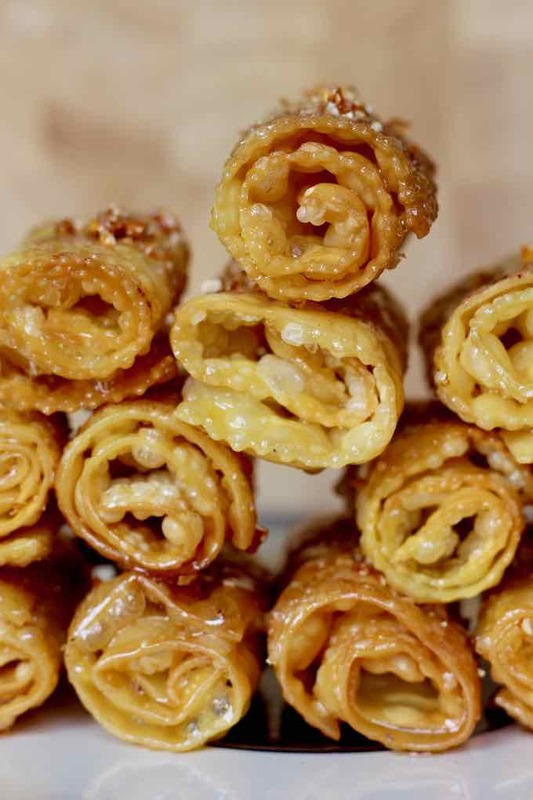 Diples are traditional Greek pastries from the Peloponnese, consisting of strips of egg-based dough that are fried and dipped in a syrup of sugar and honey. The diples are then sprinkled with finely crushed nuts and cinnamon. If we think of a land rich in history, incredible beaches and great natural beauty, we immediately think of the Peloponnese region. The Peloponnese (Πελοπόννησος) is a geographically historical region of southern Greece, which forms a peninsula between the Ionian Sea and the Aegean Sea. The Peloponnese stretches over 8,300 square miles and is the southern part of mainland Greece from which it is separated by the Gulf of Corinth to the north and the Gulf of Saronic to the northeast. Today’s recipe was born in the Peloponnese, at the other end of continental Greece, in a region called Laconia. Although the diples are popular in much of the Peloponnese, the Byzantine city of Mani is the cradle of these little wonders. The region around Mani is rough, not very conducive to agriculture. Many ancestors lived there in poverty, forced to feed many mouths with creativity and ingenuity. The diples are one of many examples of their ingenuity in cooking. Most of the best dishes of Greek cuisine are simple, use few ingredients and are highly appreciated by Greeks and lovers of Greek cuisine. Pastries go back more than 7000 years and it is among the Greeks that we find the first cake. This cake was called obelias, meaning “offering”, a pastry that was used to make offerings to the Greek gods. 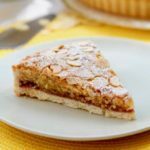 It was made of flour and honey, a very simple cake that looked more like a galette. The Greeks heated the dough on a hot stone to bake it. But these are, of course, only the beginnings of pastries, as for a long time, men only had flour and honey available to them. 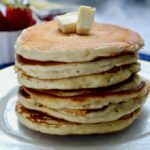 It is only when eggs, sugar and butter appeared that we could really start talking about cake. In the 7th century, the breeding of chickens became common. It marked a turning point in the evolution of pastries. Then, in the Middle Ages, people discovered sugar cane and the ancestor of puff pastry called bourreck. The Greeks were therefore probably the first people to be referred to as the first precursors in the art of baking, although they had honey as the only sweetener available, while among other ingredients were gradually included fruits such as grapes, walnuts and almonds and later, the use of very fermented cheeses was established, and they then fulfilled the function of our modern cream. In the fifth century BC, the Greek poet Aristophanes already mentioned several times in his writings, various types of treats, including apple breads, cream biscuits and jelly cakes. 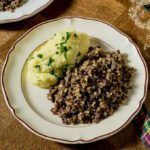 Among the ancient Greeks, fifteen centuries before our era, the taste for festivities was particularly pronounced, which led to the development of many recipes. 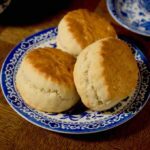 Bakers and cooks held a prestigious position in society; they were sought after and respected. Their utensils were scarce and the kitchen was made of earthenware dishes, a rudimentary material that over time has been supplemented or replaced by all kinds of tools and metal containers, and sometimes even precious metals. Cradle of ancient flavors, intense and fragrant, Greek pastries are the most characteristic of the Mediterranean culture. In Ancient Greece, Zeus, Artemide, and Apollo were loved sweet and irresistible creations, rich in spicy aromas, dried fruits, and ricotta. Greek delicacies are united by a unique and undisputed binder: honey, an omnipresent element of Greek pastries. By the way, did you know that Greece is the only country in Europe where bees continue to proliferate? Especially in the Peloponnese where the land remains in a natural and wild state, without intensive agriculture or pesticides. Bees, especially in the Peloponnese, have escaped the diseases affecting the rest of Europe and produce a high quality artisanal honey, thanks to the favorable climate and the diversity of the flora. Honey, as well as nuts, symbolize prosperity, fertility and joy in the Greek tradition. Filo dough is used in many Greek pastries today, as in galaktoboureko, a pastry cream, gently wrapped in this very delicate dough. 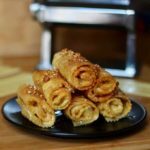 Filo dough is also used in the baklava recipe, a very popular cake throughout the region, that is prepared with butter, almonds and/or walnuts and flavored with lemon and/or cinnamon. 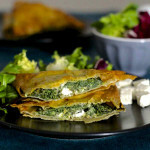 First of all, you need to prepare a dough consisting mainly of flour and eggs, and flavored with ouzo, a Greek brandy. This dough must imperatively rest in the fridge for at least two hours before rolling it. 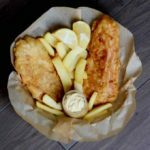 To get a good result, there are two different methods: the most classic, which requires some skills and a large amount of elbow grease, is to stretch the dough using a rolling pin until it is reduced to an ultra thin sheet. The second, simplest method is to use a special machine to stretch the dough, and there are two variants. Indeed, the utensil essential to prepare these diples, and to facilitate and accelerate the process, is a pasta machine. Although a manual pasta machine already makes it much easier to roll the dough very thinly, an electric version will shorten the preparation time by half. Only an ultra-thinly rolled dough can be used to make authentic diples, that are light, thin and crusty. For this it is necessary that the dough is rolled so thinly that it must be transparent to the point that one can almost see through it. Each piece of dough must be rolled twice for each thickness setting, and it needs to be floured slightly in between. You will start with the #1 setting and gradually increase to reach the thinnest setting. 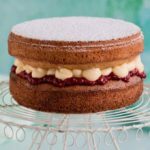 If you choose to stretch it with a rolling pin, you must do it on a well-floured work surface to get exactly the same result as with the pasta machine. You can give diples different shapes, among which the most common are: spiral (as in our recipe) or bow-shaped. – Roll the dough strip on itself without tightening and closing it with egg white. – Roll the dough strip with a fork while cooking. The preparation of diples in a spiral form requires more skills than that of simple bow tie. The simplest method is to wrap the end of the dough band around a fork, dip it into the hot oil and quickly wrap the dough around the fork. It is necessary to operate very quickly because the dough is very thin and it could burn. The diples, which cook very quickly, must be barely golden. I highly recommend that you fry the diples one by one. For this, I recommend that you use a small deep pan. 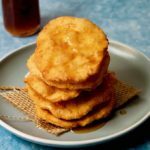 Also in Greece, in Crete, the tradition is to make dairy-free and egg-free thiples, mainly for weddings. 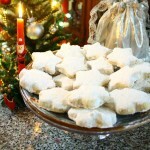 These are called xerotigana (ξεροτήγανα). 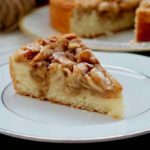 They are made with very long zig-zag strips of dough that form a spiral and are, of course, served with honey and chopped nuts. 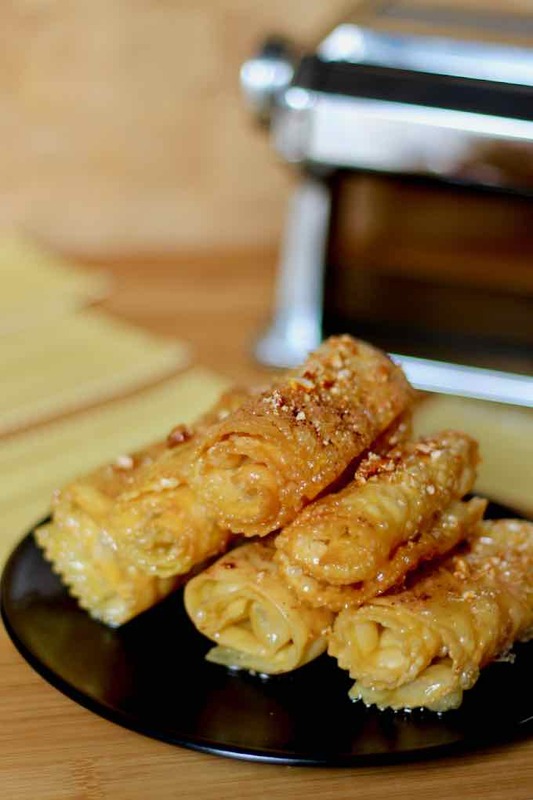 In Tunisia, people enjoy deblas also called manicotti, while in Morocco they are called fazuelos or agriouez. In the Spanish zone of Morocco, they are called hijuelas. You will have noticed that I only used the plural: indeed, these diples are addictive and I challenge you to stop after eating one! 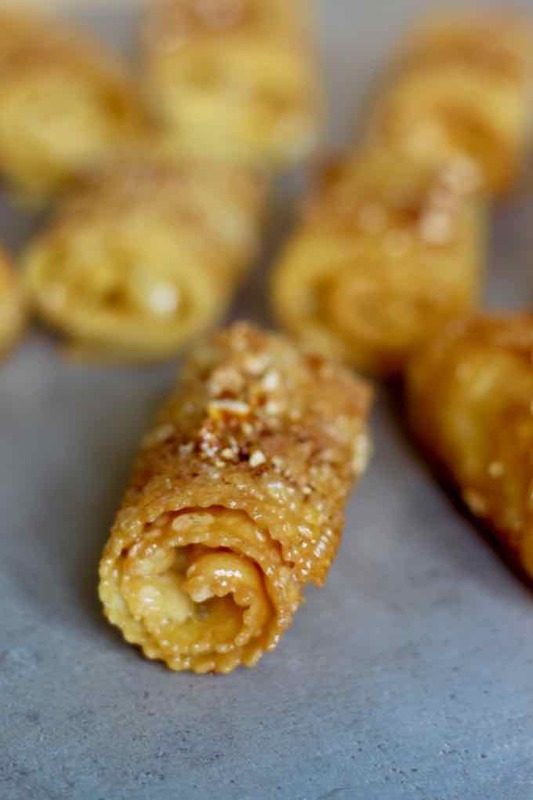 Diples (or thiples) are typical Greek pastries of the Peloponnese region, composed of a fried egg-based dough, dipped in a syrup of sugar and honey, and sprinkled with crushed walnuts and cinnamon. In a large bowl, lightly beat the eggs and add the ouzo. In the bowl of a stand mixer, mix the flour, baking powder and salt and dig a well in the center of this mixture. Pour the egg and ouzo mixture into the center of this well, and using the flat beater, knead on medium speed until the dough is firm, smooth and elastic. If the dough does not reach the desired consistency, add 1 or 2 tablespoons of water. Form a ball, cover with plastic wrap and let the dough rest in a cool place for 2 hours. Divide the dough into 12 pieces and roll them thinly into rectangular shapes. Roll each piece of dough in a pasta machine, rolling the dough several times, and flouring lightly in between each roll. Start with the #1 and increase gradually to reach the last notch to obtain the thinnest possible dough. If you choose to stretch it with a rolling pin, you must do it on a well-floured work surface to obtain exactly the same result as with the pasta machine. Using a fluted pastry wheel cutter (or a standard circular wheel), cut rectangular strips about 10 inches long and 3 inches wide. Repeat the process until there is no more dough. Pour a large amount of oil in a deep saucepan or skillet on medium-high heat. Wrap the end of the strip of dough around a fork (one turn), dip it into the hot oil and quickly wrap the dough around the fork. Complete the process very quickly as the dough is very thin and it could burn. Carefully remove the fork and cook the other side until reaching a light golden color. Remove the diples from the pan with a skimmer and place on paper towels. Repeat the process until all the strips of dough are fried. In a non-stick pan on high heat, mix the water and sugar. Cook for 5 minutes after it starts boiling. Add the juice, lemon zest and honey. Soak the diples in the syrup, leaving each one immersed in the syrup for 5 seconds on each side. Place them on a dish and sprinkle with crushed nuts and cinnamon. Set aside for a few hours in a dry place before serving.